Sub Title- Beauty used to be worth going thirsty for- but now you can buy Cokes even here! Getting there and out: From Leh hiring a taxi is the best way of getting to Karzok. Karzok is 220 kms away from Leh, 160 kms of which is on a tarred road. Including a one hour halt for a bath in the hot springs of Chumathang and a meal there it will take about 9 hrs of very relaxed travel even after stopping at innumerable photogenic view points. Snack/meal stops can be had at Upshi and Hemiya too. The taxi charges are about Rs. 3000/- per day + petrol/diesel. Better to hire a taxi for the duration of the entire trip and ask the driver to meet you at Hanle 5 days later. Guide and ponies can be got at Karzok. Karzok has tented accommodation and also a couple of restaurants open from May to October. Karzok is connected by a weekly whimsical bus service from Leh. It has several Guest Houses and retaurants now, and even solar power. A much changed and more comfortable place since we first walked there in 1984 and 1993. Change staretd from that year on. RECOMMEND – Spending two nights and a day at Karzok acclimatizing by climbing high and sleeping low. Go up the mountain on the other side of the Karzok stream. After climbing for 500 m or so part of the route till Lenak La will be seen. Also a heart stopping view of the lake over which loom on its eastern shore the Labgo group of 7 peaks all above 6000 m. Three of these are 6622, 6666 and 6350 and have some snow and ice on them. For people driving in from Manali take a turn to the right off the straight somewhat tarred road into the wide More Plains 25 kms or so from the tented colony of restaurants in Pang. Be careful not to loose your way from here. Keep heading right through a field of tama bushes towards the village of Thukse Gompa and then the salt lakes of Tso Kar & Tsarspuk tso. Cross Polokonka La to Puga of the many hot geysers and then 41 kms to Tso Moriri after crossing Puga Tokpo. There is a twice a week bus service from Leh to Hanle and back but if it does not come you can get a lift in one of the supply trucks returning from Hanle’s huge optical and radio telescope being managed by the Indian Institute of Astrophysics. Their spacious, very comfortable and very cheap Guest House is worth staying in provided advance booking is done from Leh or Bangalore . Otherwise, even if there are no occupants, you will not be allowed in. Introduction: I like going to high altitude places where there is no chance of coming across any humans and where there is always sunshine. The South East portion of Ladakh- Rupshu desert of the Changthang (high plateau) was my favourite haunt for years. This trek crosses the 2nd last outlier of the Zanskar range to the east of Tso Moriri and then takes one through one of the most attractive and contrasting areas of Ladakh. 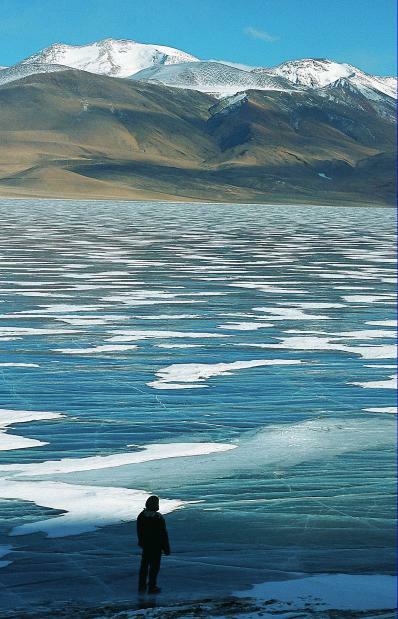 Amidst so much sterility is a spot of green around a fresh water lake called Lam Tso. There are peaks that tower on either side with snow line starting from above 6300 metres. The wind in the afternoon moves towers of sand. Water is scarce. A very relaxed trek along the western shore of the lake. Head towards the south after crossing Karzok stream. There is a clear track on which to walk. Kiangdom is at the western edge of the south bank of the Tso Moriri. Set up camp in a Rupshu like grassy patch. Tufts of grass separated by 15-20 cms patches of sand. All around are marmot holes. They entertain by popping up and staring at you and then dashing back in. Fresh water can be collected from the Phirse Fu, which flows nearby. Skirt the south end of Tso Moriri over a grass and sand grazing ground and then walk 6 kms over the gravelly bed of the north flowing branch of Phirse Phu in an ESE direction and then cross the south flowing Nurbo Dongri about 2 kms below the several twisted pools that form the SE extreme end of the lake. Slightly squishy and marshy in places. Traverse 2 springs. Fill up water here if trekking from May to early July. Last point for the rest of the day. Sheep shelters and ruins of an old village called Shinkpe. Walk 3 kms straight up in a NNE direction to Dungti/Narbu la (4785 m), which is a widish plain marked by the usual chorten with horns on top. Next 10 kms through a fairly level ground over the dry bed of Rankhang Lungpa and a climb over narrowing terrain will take you to a wide Ungti la (5213 m) graced with several cairns and chortens most of which are crumbling. Magnificent view of where you have come from and what you have to go through. Stay awhile. Look back. Look ahead. Peak Shulchule (6535 m) dominates the view to the North and later it will with another lesser promontory of 6110 m loom arrogantly over your horizon when you head east towards the camping ground, a little south of Lam Tso, which cannot be seen from Ungti La. Instead 200 m below and to the East extends a daunting, vast, yellowish, shimmering wasteland. There are two ways from here. One is directly south of the chortens and another straight north for 2 kms and then NNW for Kyun La (5110 m) and the twin lakes by that name. One is brackish and the north one fresh. Take the former. Walk for about 6 kms due south. The path dips into a narrow (at times less than 1 m across) sand and bone dry pebbly bed of the Takarrpo Lungpa skirting the forbidding Tegazung plain to its east. Open scrub100 m wide valley. It is the beginning of an important tributary (tho dry here) of the Pare Chu, the main branch of which comes down from the Parang la. . Cross the open scrub river bed. Turn east for another 4 kms and cross a short hill to reach Lam Tso (4870 m), which looks like the Garden of Eden. Green grass, sheep being shorn, ducks contendedly squawking, puppies yelping and yaks being milked. This noise, which begins as a murmur just before you top the hill is a good guide as it will be almost dark by the time you get here. 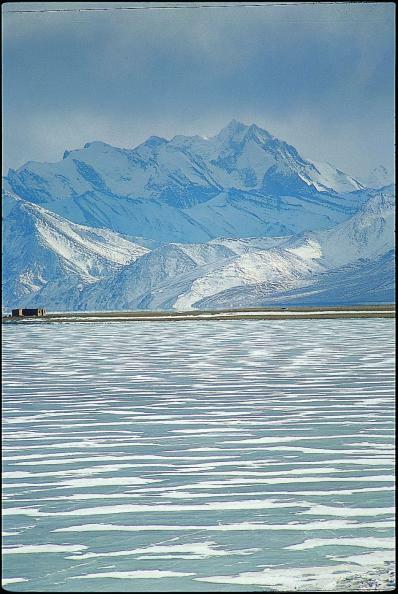 Can see the water rich Pare chu about 12 kms away to the south near Chumur the last border village before Tibet . This day’s trek cannot be broken up into two as there is no water along the route. Start late after walking around the 2 kms lake. In fact, if you are interested in birds, a day’s halt here would be exciting. First few metres are over the remnants of the marsh near which the camp ought to be. After 3 kms leave the plain to enter a wide gully in which in 1984 when I first went there there were many strange stones about 60 cms high and 30 wide, rough from the outside but inside were small smooth alcoves almost as if they had been fashioned by a careful hand. Obviously a meteorite formation. This is what we had seen in 1984. Since then a rough road has been built, be seen. Removed to decorate homes and temples etc to build convenient supernatural myths around them. A km from here is a motor road traversing this gully coming down from Sarsar La to the north. As a result of this road not a single stone is left. Many mane walls and chortens around here. Head south for Dongan marsh (4900 m) which is near a spring surrounded by stones and boulders and pebbles. The clear Dongan Phu flows through it. It originates from the 6378 m high peak to the south of Lenak La which is east of this place. On the west of the campsite is a steep jagged cracked rock outcrop and on the east is a shelf of scree and sand. Trek starts by climbing over the shelf and a trudge of about 5 kms over gently increasing incline. The 3 kms of a steep and rough climb. The dominant colour is yellow but there are black, blue, green and brown hills, boulders and stones too. The pass is a long rolling plain about a km in width running in a north to south direction. In the north are two peaks 6215 (Hendling) and 6125. To the south is a rocky peak 6378 m from which a km long glacier pours out. There are two points to cross the pass. 5525 and 5510 m. Take the former. It’s a wind blown pass if crossed in the afternoon. No snow. Descend down the main branch of the Lenak Tokpo, which combines the tributaries from small glaciers on the above peaks. Now water in plenty. Continue descending. Gongrale camp site (4800 m) is well marked with cairns . The Lenak Tokpo merges with the Khaptak Tokpo near here. Topographically this is a very interesting day. For, on crossing the Lenak la you will have finally crossed the eastern most outlier of the Zaskar range and now you are finally in what is known as the Trans Himalaya. Welcome to many surprises. Its infinitely drier than the previous marches –if that is possible. 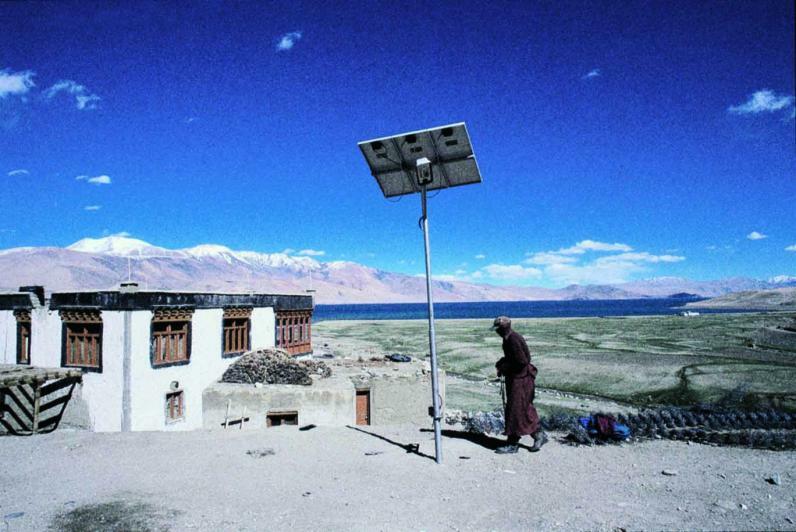 Yet, within the same day (next day) you will come to the widest greenest expanse you will have seen since leaving Leh. Follow the Khaptak Tokpo for 8 kms to where the sand flats become wider to encompass open scrub and meet another even wider sandy stretch coming in from the left and NNE. Here is a 4 m deep and 10 m diameter pit. It enclosed something exceedingly gory when we walked by in June 1984. The remains –flesh, fur, claws and paws- of a snow leopard. This is a trap meant for that rare species as it kills their pashmina goats and other sheep. Leave the river bed here and walk left and slightly north for 4 kms and then climb a short shelf towards the east, pass an ancient ruined chorten at Lato, till you reach the 12 kms long very dry Thangchugkiri Plain. It’s a sand and salt plain and taking this cuts off 10 kms from the usual route that goes along the Hanle river through Nilamkhul plain, which now has a motorable road running on the northern edge of it. Descend to this plain between two rocky knolls of 4657 and 4545 m. The route skirts the large bumpy Garichyam marsh with saline tops. Five large streams pour into it and one comes out. There’s life everywhere again. Yaks, sheep, ponies and dogs. The plain is roughly 10 –12 kms in diameter plain and is dominated by the Hanle Gompa on a hill that is 4350 m high. 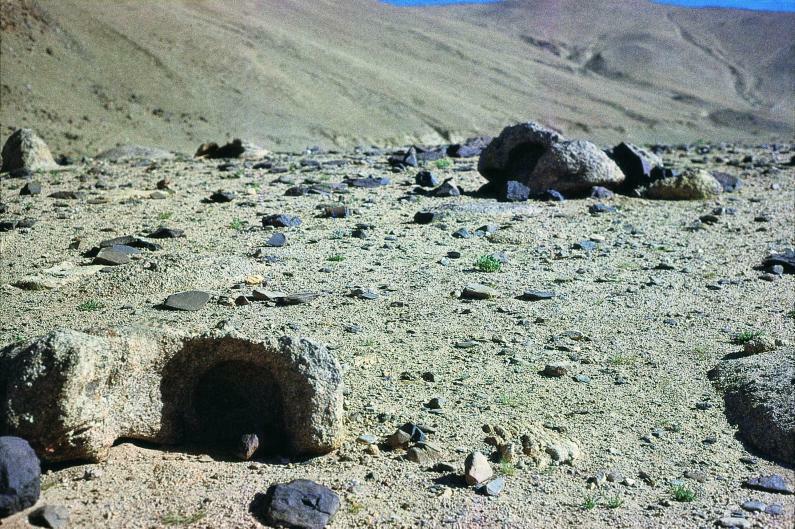 Box: The Hanle gompa was built by a ruler of Leh called Sengge Namgyal in the mid 17th C and parts of it are in ruins. He had built it when he was exiled here. It’s a must visit place for the view from here is staggering. Especially that along the Hanle river as it flows north towards Loma through the larger Mankhang plain. I had mentioned an ancient chorten at Lato. There are 7 other Latos in this vicinity, which means ancient chorten. A modern day wonder is the radio and optical telescope on an another hill near Hanle. Its been placed here so that it can monitor the stars constantly with the other telescope in Nevada , USA . Together they have the stars under 24 hour observation. Going inside, by prior permission please remember, is like stepping into a sci fi set. From adobe homes and barley fields and yaks with bells you are transported to a 180˚ swiveling radio telescope controlled from Bangalore ! It has a few young astronomers from Ladakh working here. The images that they pick up can be instantly seen on the small, medium and large computer screens. And best of all. No one objects to taking photographs. The flora of high altitude Ladakh (known as the Changthang of which the Rupshu desert is a small part) emerges from its hibernation only from late July and then disappears by early September. There are herbs like lachhu (rheum webbianum) and khardung (biebersteinia odora). Occasionally you can spot the brahm kamal (saussurea obvallata) and the blue poppy (meconopsis aculeata) near the wetlands hiding behind rocks. In late August the yellow flowers of khardung and lukmentok (cremathodium ellisii) brighten up many tracks. On this route you can see marmots, red fox, a wolf if you are not noisy, and bharal. The snow wolf and snow leopard also maraud around. The bar and the grey headed geese, ruddy shelduck and the brahminy duck infest Lam Tso and Hanle’s marshes from June to August. Around Hanle can also be seen the rare black necked crane. On the return journey from Hanle before crossing the junctionof the Hanle and Indus rivers at Loma Bend carry on the left bank of the Indus for 4 – 5 kms and before Dungti you will invariably see 2 pairs of black necked cranes. Occasionally you canalso see the yellow headed great Himalayan eagle and the white crested lammergeier. In June 1985 some friends and I were in the Jadh Ganga valley trying to climb some 6000 + peaks south of the Tsangchok la and also Chirbas Parbat (6525). None of these villages is inhabited. Till 1962 the mysterious Tibetan Jadhs- a phratery of the Bhotias of Western Tibet used to live here. They have now been resettled on both sides of a straight cobbled street in Harsil below Wilson ’s Cottage. Instead there are jawans guarding this territory from an imminent attack by the Chinese, who are meanwhile busy concentrating on winning an economic war by flooding India with cheap smuggled goods. Very interesting route. 3 kms ahead is Dhumku (3245 m) on the left bank. Opposite from NNW the Chor Gad Nalla roars in to meet the Jadh. During colonial times when tax used to be collected from goods coming into and going to Tibet people used to use these hidden ways to avoid tax. A crumbling route goes up this river to the sources of the Baspa river in H.P. and then over the 5545 m high Yamrang La to Tibet . Dramatic entrance to Chor Gad provided by a perfect pyramid rock peak Chagle (5992 m). Steep granite cliffs of the Zanskar throttle the Chor Gad. Look south while passing Neelang. Kalidhang (6373 m), its lesser peaks and overhanging glaciers overawe. Its drained by the Dahi Bamak nalla which meets the the jadh’s left bank here. 2 kms later to avoid the huge vertical rock cliffs on the left bank cross to the right bank by a sturdy log bridge over a narrow and deep chasm. Vegetation becomes sparse, trees disappear and pink wild rose bushes are sprinkled all over the dry prospect. See the turbulent Guli gad meet the Jadh on the left bank after draining the glaciers of the Guli Dhar and Chirbas (6525 m) & Matri (6721 m). Cross to the left bank just before Naga, which nestles in the narrow confines of two gorges. The Nilapani which meets the Jadh here.